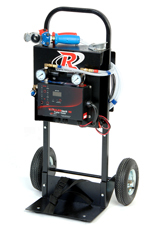 Redtech Inc. is based in Drummondville, QC and has been making Trailerteck trailer testers for over 25 years. The Trailerteck T05 Model has been tried and tested by top fleets across North America. It makes trailer inspections fast and simple and provides a valuable troubleshooting tool. 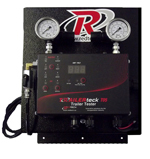 Simply connect the T05 to the front of the trailer, then walk around the trailer with the remote to easily confirm that electrical and pneumatic systems are operating normally..
Activate both the Emergency and Service brake functions and allow the air pressure to stabilize. Shut off the manual air entry valve to prevent the air from flowing into the device and the trailer. 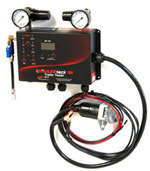 Since the device is air tight, a pressure drop on one of the two the pressure gauges means an air leak in the corresponding air circuit of the trailer. 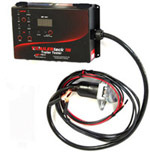 The built in ammeter can help find electrical problems such as faulty connections or corrosion. Electrical problems have a tendency to create resistance, which generates heat, which then causes the amperage draw to rise slowly. Activate all the electrical functions and wait for approximately one minute for the current draw to stabilize. If you see a continuous but slow increase in the amperage draw, 0.1 Amp at a time, this is an indication of an electrical problem. If this is the case, Turn off all the lights then isolate each circuit by bringing the light circuits on individually until you find out in which electrical circuit is creating the problem. If a short circuit is found in one of the activated functions, the corresponding light will blink on the control panel. At the same, a sound signal will be heard until the function is deactivated or the short circuit fixed. If there is a ground problem on the trailer, during the inspection, the Trailertteck device will exhibit unpredictable behavior. That happens when the activated functions on the trailer don't match the signals sent by the remote. If you suspect a faulty ground circuit, simply connect the T05 Ground Lead clip to good ground source on the trailer and observe if there are any changes. If you are able to eliminate that problem, this confirms that you have a faulty ground circuit.